Prevention is a key part of your comprehensive dental care. Studies have found strong links between major health issues, including heart disease and strokes, and oral health. As part of our gentle dental services, Dr. Abraham provides preventive care to patients of all ages to help them get and maintain a healthy, beautiful smile. Every six months you should come in for a routine dental exam and cleaning to ensure that your teeth and gums are in great shape. During these appointments, we’ll get rid of any tartar and plaque that’s built up and then polish and floss your teeth. 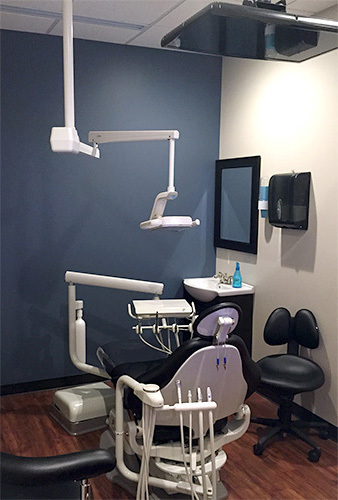 Dr. Abraham will evaluate your overall oral health and hygiene so we can stay on top of any developing issues. Have you noticed that sometimes food can get stuck in those little crevices on the surfaces of your back teeth? We place dental sealants so bacteria can’t settle in there and turn into a cavities. Sealants are particularly useful with children who may find it hard to sufficiently clean those hard-to-reach teeth, but they work well for adults too. We want you to feel at ease while you’re with us, and we know that many of our patients deal with some level of dental anxiety. Our practice offers nitrous oxide, or laughing gas, to help keep the anxiety at bay and keep you comfortable in the dental chair. Nitrous oxide is a sweet smelling gas that you inhale through a mask worn over the nose and mouth. It gives you a feeling of heightened relaxation while we complete your exam, cleaning, or other procedure. Once we’re all done, just breathe regular air for a few minutes and you’ll be back to normal. A toothache can be something simple or it can be a sign of some deeper problem. If your tooth is bothering you, call us and schedule an appointment, so we can take a look and decide what needs to be done. If we find that decay has turned into a cavity, we’ll recommend a tooth-colored filling, which we can often place during that same appointment. Tooth pain can also be caused by a chip or crack. If that’s the case, you may need a crown. We’ll place a temporary crown that day to help relieve your pain while our lab creates your permanent crown. Once the permanent crown is ready, we’ll bring you back in for a fitting – we want to make sure your new crown fits exactly right so there isn’t any change to your bite. Another reason for a toothache is an infection in the root of the tooth. An infected tooth root may need root canal therapy to ensure complete healing. If that’s the case, we’ll use sedation to keep you comfortable while we clean out the infected tooth pulp, seal the tooth’s interior, and fill it to keep out future infections. To complete the procedure, we fit you with a crown to give that tooth some extra strength and protection. We always want to save your natural teeth, but sometimes, infection or trauma causes us to have to remove a tooth. If we recommend a tooth extraction, rest assured that you are in good hands with us. We will keep you comfortable throughout the procedure with sedation. Once we’ve removed the tooth, we will fit you with the best tooth replacement option for your needs, budget, and lifestyle. In fact, we’ll discuss this with you before the removal procedure even begins, so you know what to expect during and after the extraction. We will also send you home with detailed care instructions to make sure that you’re comfortable after you leave our office. We can use dental lasers to find and treat a number of dental health problems, ranging from canker sores and cavities to periodontal (gum) disease. Lasers are ideal because the limit the amount of healthy tooth structure we remove when we’re taking out decay in preparation for a filling. They also allow us to be amazingly precise when we’re treating periodontal problems. Dental lasers essentially eliminate the need for scalpels and sutures in oral surgery and gum treatments, and they also speed up healing time. Overall, the introduction of dental lasers to routine procedures have improved the efficiency of our treatments.